Young prop forward Will Maher has been tipped for a bright future in Super League after impressing on his seasonal debut for Castleford Tigers in their 22-14 victory at Warrington on Monday. 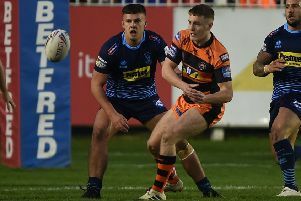 Tigers head coach Daryl Powell was delighted with the display of 19-year-old Maher when he came off the bench at the Halliwell Jones Stadium. He told the Express: “Will was excellent. “There was a direct comparison. His first game was at Warrington last year in slightly different circumstances, but he looked a different player this time around. “I thought he carried the ball strongly, defended well and looked like he was a Super League player in the making. “He’s certainly someone I would not have any hesitation in using again. “He’s a pretty big man and he’s going to get better. He’s going to get physically thicker and he’s using his body really well. “Alongside him being a really good solid kid as well he’s really developing into a good player.